I am convinced that some of Cherokee County’s greatest resources are the people living here. I continue to meet the most interesting people. I recently received a call from Cliff Wilbur after he read one of my articles. He invited me to come out and visit for a while, that it would definitely be worth my time. He was so right! 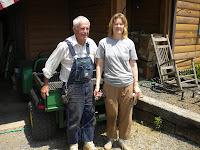 Cliff has carved out an amazing organic garden on the top of his multi acre mountain top farm. We strolled down the gravel roads that he has created as he pointed out the various plants. He has his own method of selective propagation. He simply selects the hardiest, best tasting of his fruits and vegetables and saves the seed for next year’s planting. While this method is not extremely complicated, it seems to be a proven method that is working very well for him. It proves to me that a PhD in agriculture is not needed to be successful gardener. As a retired high school principal, Mr. Wilbur moved into the area with a keen interest in organic gardening and a sincere love and respect for the land. He could inspire anyone to be better stewards of the land. This directly relates to his additional concern for healthy living and assisting his fellow man. He told me that he gives away baskets of fresh organic fruits and vegetables every year. He is more than willing to help anyone who is willing to help themselves. As for healthy living, he appears to be a specimen of good health at 80 years of age. Clear skin, a light step and clear blue eyes tell me that he pays attention to his diet and exercise. Just walking the steep roads on a daily basis gives him plenty of aerobic exercise. He filters all of his water for purity. Combine this with his organic food and you have the perfect combination for good health. His daughter, Vickie, lives with him and assists him with the daily chores of maintaining the property. She graciously treated me to strawberry shortcake with home made whipped cream that she has just made. The strawberries had been harvested on the morning of my visit. It just doesn’t get any better! In keeping with my love of receiving plants from friends, Cliff gave me my very own little peach tree. He showed me how he tenderly plants the new trees beside a bamboo stalk and prunes away the excess leaves as the new little tree grows straight, tied along side the bamboo stalk. You have probably already guessed the name of my new little peach tree- yep, Cliff it is! It seems that sewing skills are becoming a thing of the past. At one time, most of the schools taught basic sewing skills. Once you mastered your project, usually an apron, most students retained at least enough knowledge to make clothing repairs. Many students went a step further and attempted sewing clothing for themselves and their children. 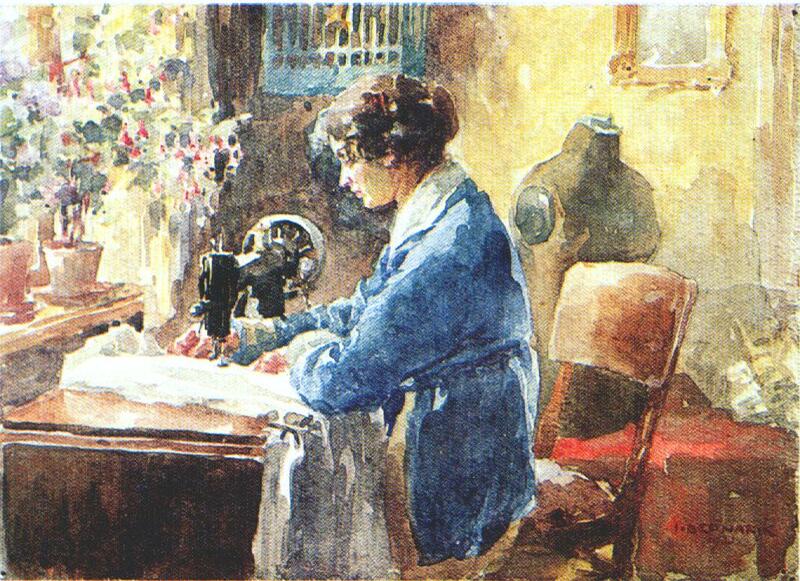 I think that it is a great loss that sewing has been removed from many schools. I have had several requests from adults who wish to learn how to sew. They either missed their chance while in school or simply want to become more proficient. At the extension office I offer Thursday afternoon sewing for adults and for students after school. These sessions are informal with the participants working on individual projects. I am present to answer questions and offer guidance. During the summer I plan to offer an 8 to 10 week sewing program that will cover specific skills. We will discuss sewing machine operation and minor maintenance. Included in this portion will be operating the serger or overlock machine. Other topics include zipper application, pockets, sleeves, casings, collars, and facings. These skills can also be used when sewing items other than clothing. Many dollars can be saved sewing items such as curtains, decorative pillows, pillow shams, and bed-skirts. I have found that I thoroughly enjoy finding a spread or comforter that I like and then coordinate other fabrics with it to make the accessories. I can create my own interior designer look for a lot less money. I can never seem to find bed skirts that are long enough. I have bought a bed skirt and added a contrasting layer to make it longer. Of course if I make the entire bed skirt I do not have a problem getting it long enough. Curtains are fairly easy and quick. Draperies, on the other hand, are another story. I really need to be in the mood to tackle draperies! Pinch pleats must be accurately measured for the pleats to be even. It is really a mathematical challenge because the return must be calculated for each panel also. Thus, I submit to purchasing if I want draperies. I have assisted many mommies decorating their baby’s nursery. This is so much fun and the possibilities are endless with all of the cute fabric prints on the market today. The main problem with sewing is finding a good fabric source. Many of the fabric stores are out of business. I am sure that this is partly because the number of people sewing has dropped dramatically in the past twenty years. There are still good fabric stores available if you are willing to make the drive! I am especially concerned for our youth who are dependent on their caretakers for general health needs. Children must be given nutritious food to meet their growing needs. Fast food and convenience foods that are consumed on a regular basis do not provide all of the essential vitamins and minerals that growing bodies need. When poor nutrition is combined with low physical activity levels, the result is overweight children. Not only are these children overweight, they are showing symptoms of chronic disease once seen primarily in adults. More and more children are being diagnosed with type II diabetes. Our children are also showing symptoms of brittle bones. This is mainly because children are drinking less milk and participating in very few exercises that are weight bearing. Weight bearing exercises would be jumping rope, climbing trees, doing pull-ups, and simply chasing each other. Many statisticians feel that the current generation may be the first in a very long time to have a shorter lifespan than their parents. As a result of these staggering statistics we are being bombarded with news articles, specials on television and books addressing the problem of being overweight. It seems that children are not the only overweight segment of our population. Over 60% of North Carolinians are either overweight or obese. This is the popular buzzword –obesity. Most of us tend to associate obesity with morbid obesity, extreme overweight. Television reality shows are exploiting our concern with obesity. We can see everything from the Biggest Losers to a sitcom featuring an overweight policeman and his wife. This is not a totally new trend. Rose Ann and her husband were the average overweight American middle class couple years ago. It is about time that we wake up and face the dangers of being overweight. Health issues such as high blood pressure and diabetes are known to be associated with excessive weight. Add to that the fact that many insurance companies are now increasing premiums to the health insurance policy if the policyholder is overweight. Another health risk that may make your premium increase is if you use tobacco products. It is a shame that our general population needs the insurance companies to force us to take responsibility for our own health. Take a long hard look at yourself and your family. Answer these few questions to determine whether your family needs to make some changes! 1. Are all family members in the healthy weight range according to reliable weight charts? 3. Does the family eat meals at home at least five out of the seven days? Teresa Really Does Practice What She Preaches!!!! Hooray! We are officially in season for fresh fruits and vegetables! Shannon Coleman, the Cherokee County 4-H agent surprised me on my birthday with a fruit medley instead of the traditional birthday cake! Since I have been lovingly dubbed the food police around our office, the fruit was greatly appreciated! I will be able to indulge on my “cake” all day long and will not have the remorse of falling off my healthy eating wagon! 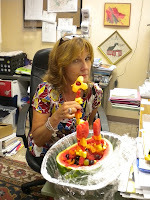 I am nibbling on grapes, pineapple, cantaloupe, strawberries, and watermelon. Just this morning I was reading an article about the health benefits of strawberries. The following strawberry smoothie recipe has about 174 calories and is packed with the health benefits of strawberries. 1. Remove stems from strawberries and wash.
2. Blend all ingredients in blender until smooth. According to the George Mateljan Foundation, “researchers have recently ranked the 50 best antioxidant sources among commonly eaten foods and found strawberries to be quite exceptional. When total antioxidant capacity was measured against a uniform amount of food (100 grams, or about 3.5 ounces), strawberries ranked 27th best among U.S. foods. In addition, when only fruits were considered, strawberries came out 4th among all fruits (behind blackberries, cranberries, and raspberries. )” Strawberries are a popular fruit for many desserts. While the strawberries provide that exceptional color and flavor, the added sugar probably negates the health benefits of strawberries. 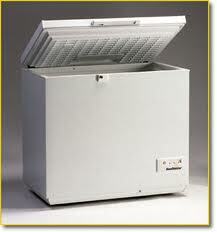 The same would hold true for strawberry jams and jellies. Enjoy the season of strawberries! They are in peak season right now and best enjoyed just as they are when picked! Simply rinse and enjoy. Remember, strawberries should not be soaked in water. They tend to absorb too much water. Texana, Martin’s Creek, Sunrisers, Grape Creek Lady Volunteers, Peachtree, Ranger, and Valley Town. Programs from the home agent often covered life skills that could help improve conditions for the rural family. Everything from parenting skills to canning programs was delivered in local homes. Some of the programs were just for fun- such as making candles and mattresses and hat decorating. I imagine there were some fancy bonnets in the Easter Parade in Cherokee County some years back! 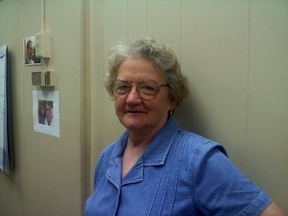 Helen values the education that she received from the home agent and the ECA programs. 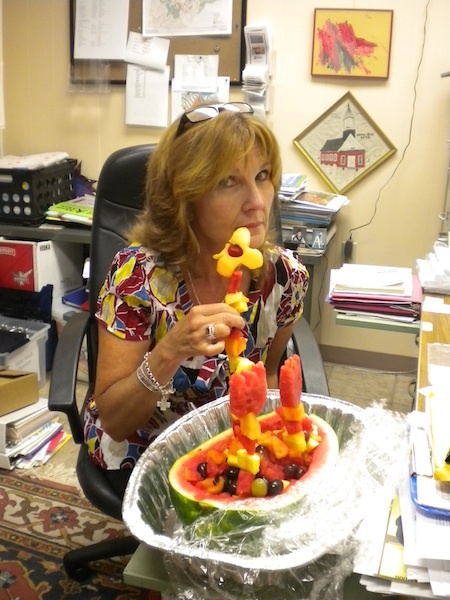 Helen states that she is very proud and appreciative of the education that she received from Cooperative Extension. She attributes her knowledge and love of ECA to the county home agent, Miss Thelma Wheeler. “She made us want to do better,” states Helen as she fondly recalls the stern home agent. Her no nonsense approach to rural living helped the local families strive to improve their homes. Today we tend to take advantage of our indoor plumbing and screened windows and doors. Miss Wheeler, who had previously worked in Kentucky, pushed the local residents to strive for these two household amenities, if nothing else. Helen says that she remembers when most people did not have grass in their yards. I also remember my own mother talking about sweeping the front yard since there was no grass. Helen also recalls a conversation with Miss Wheeler. She warned Miss Wheeler that the rural residents of Cherokee County might not be quite as behind as Kentucky but our folks are mighty prideful! 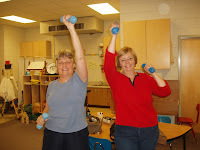 Teachers at Ranger and Murphy schools are on board for Eat Smart, Move More, Weigh Less! I believe in this program and am very excited to have so many participants involved for the next fifteen weeks. Eat Smart, Move More, Weigh Less is dedicated to encouraging people to eat better and move more! Participants decide on their own personal goal, weigh in each week, and participate in class discussions about strategies to achieve their goal. We discuss the importance of realizing that involvement in this program is a life-long commitment. With all the demands that families must juggle on a daily basis, it is often difficult to carve out the time to take care of yourself. For optimum health benefits, it is recommended that we try to be physically active for about 300 minutes a week. This could be interpreted as working out an hour a day for five days. Making time to exercise for an hour each day, Monday through Friday would leave the weekends free! Of course, we still need to be diligent with our food intake. I also think that it is important to practice moderation. Depriving yourself completely of any one food will make that particular food become almost obsessive. However, if you really are craving chocolate, permit yourself to eat a very small amount, just enough to curb the craving. Now, don ‘t tell me that your craving for chocolate can only be satisfied with a pound of chocolate! Discipline, discipline, discipline is the name of the game. It may take a week or so for your metabolism to get on board with your new daily routine. If you have not been exercising for a while, your muscles will probably be a little sore at first. This will pass. Your digestive system might also be a little upset if you suddenly change your eating habits. An increase in fiber may upset your system a little. Soluble fiber is found in your fresh fruits and vegetables and is a great way to insure that you feel full. Insoluble fiber is found in many of the peelings and in some of the fiber cereals. While your system does not directly absorb insoluble fiber, this fiber does help remove your body’s waste efficiently. I am very proud of the Ranger teachers who have completed several weeks of ESMMWl. After their first week the seventeen participants lost a total of 44 pounds. This was a fantastic achievement since the recommended safe amount of weight to lose per week is 2 pounds. The group seems to be dedicated and having a fun time so far. Good luck teachers!